The right bath features can make your bathroom feel like a space for luxury and relaxation. You want every part of your home to look outstanding and beautiful, and your bath is no exception to this rule. There is no reason for you to not have the luxurious bath of your dreams and leave everyone that uses it impressed with just how extravagant it is. To do so, make sure to keep up with all the latest bathroom trends, what bath features are popular, and find out just what is and is not worth investing in to give yourself a luxury bath. One of the most beautiful stones out there on the market is quartz, which means it is a fantastic material to use when building your dream bath. There is a wide variety of quartz available on the market that allows you to play with a variety of design schemes to craft the luxury bath you want. It is a manufactured stone, which allows for a wide range of colors and patterns that can fit with whatever design you may want. An easy way for you to appear as if you have a luxurious bath is by creating a luxurious design for your bath. A luxurious atmosphere can easily be manufactured by crafting the right design for your bath. 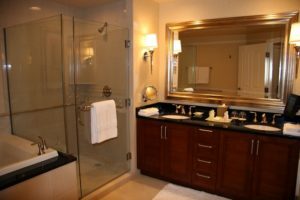 Purchasing elegant bathroom furniture is one good way to give off an upscale feel in your bath. You could even add some beautiful flowers to place on your bathroom countertop or elsewhere in your bath to add a lavish touch to it that will make everyone feel comfortable and warm. Take the opportunity to pamper yourself in your bathroom for an even bigger luxurious feel. Soft, beautiful towels will leave an impression on all of just how fancy and stunning your bath is. Putting luxurious beauty products on display in your bath too is yet another way for you to get your extravagant tastes known to the universe and show off just how luxurious your bath is. With two locations across Maryland, the J.F Johnson Lumber Company is here to assist with all of your home remodeling needs. We sell everything from cabinets, sinks, and countertops to outdoor decks and doors, using only the best hardware and materials to do so. If you’re looking to remodel your home, you have come to the right place. We have been dedicated to providing our best service and products across Maryland for almost 100 years now and we are ready to help you build your dream home. For more information regarding our products and services, please contact us or pay us a visit! Our Millersville and Edgewater locations are open Monday-Friday from 6:30am-4:30pm and Saturday from 8am-1pm. To contact our Millersville store, call 410-987-5200. Our Edgewater location can be contacted at 410-956-0400. Also, feel free to follow us on Facebook and Twitter for more updates. This entry was posted on Friday, March 30th, 2018 at 3:04 pm. Both comments and pings are currently closed.